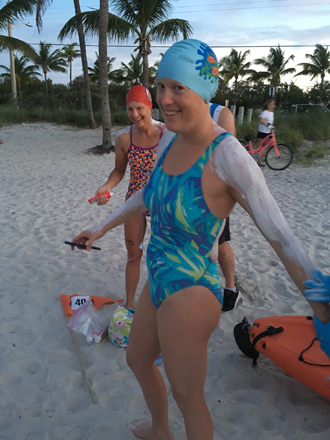 Swim Around Key West, how do I start to describe this race? It was a lot of planning and even more training and the most amount of hours in the pool I have ever spent. 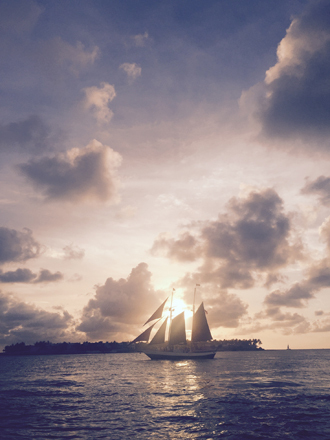 The race is a swim clockwise around Key West which is a total distance of 20k/12.5miles long. I actually can't even remember what time it started in the morning of June 4, 2016, must have been around 6:30 or 7am. Any ways, below are some pre-race photos. Mile #1 - was a blur, the water was choppy and you were being tossed every where. I was suppose to be spotting a pier, but I never saw it. Mile #3 - the water changed and it was super smooth. The race director said "You'll start to feel like Michael Phelps" Well I did to the point that I don't remember Mile #4 or #5. Mile #6 - I was trying to remember the map and the mile markers while swimming. I thought I had just started mile #5 when Andy held up 6 fingers to tell me that I was now on mile #6. I was super surprised. 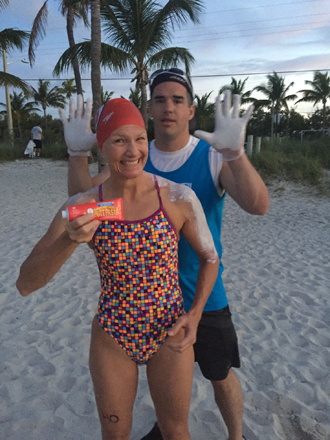 I had just swam a 10k and felt really really good." 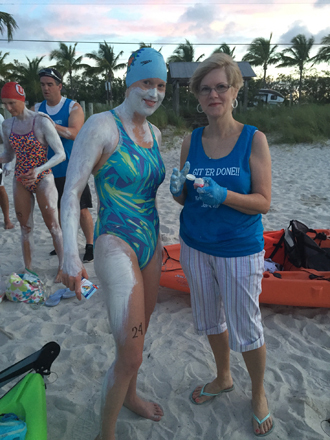 Mile #7 - was fine, I could see more things under water and I was on the Gulf side of the island. Mile #8 - was awful, you were a mile away from land so spotting was difficult, super choppy rough water, wind was bad, you were just being tossed around left and right. At the end of mile 8 you go underneath a bridge and they do a swimmer check in. That just means your kayaker yells out the swimmers name so they can keep track of who is where. Mom and Aunt Cynthia and Steve were all there to watch, but I could only here Mom cheering me on. 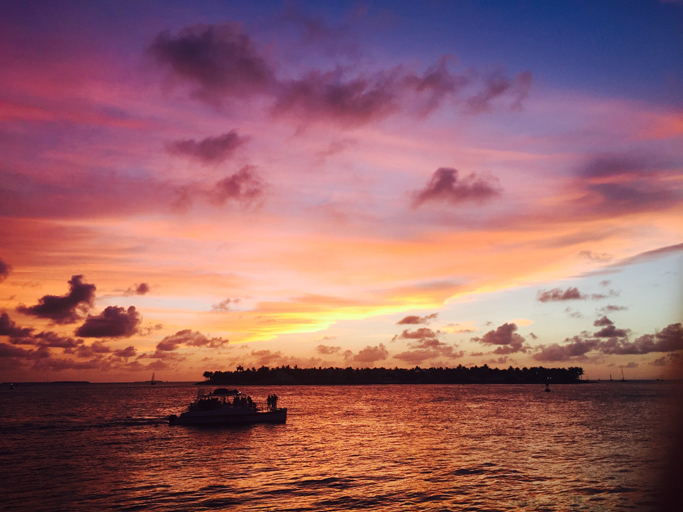 Mile #9 - you are swimming in-between Key West and another Key. The water was finally calm and it felt wonderful. Mile #11 - my right should started hurting me a lot a lot. Andy gave me some ibuprofen which took the pain down a little bit but it was still killing me. So I would swim with my left arm most of the time. It was around now that I kept telling myself only 2 miles left so just an hour of swim practice at the East Rec Center in Boulder and I'll be done. Last Mile - I was siting off of some some huge logs in the water wanting the finish line to come sooner rather then later. There was a blue kayak in front of me that was all over the place. I stopped to see what was going on and realized he was following his swimmer and the swimmer was zig zagging left and right. Totally wasting time and energy... but left the door wide open for me to go straight and get ahead of him. I did this, passed him and swam as hard as I could towards the finish line.